Assume the screen is axis aligned with origin at 0 and there is absolutely no view transformation. in other words we will simply try to project the model onto the screen plane following perspective. Say our FOV is 60 degrees, so the focal length is tan(30). Copying this from another thread where i posted this as the answer but as Wyck suggested, the correct answer is the first one. where $Y_p$ is the projected $Y$ coordinate on to the image plane. 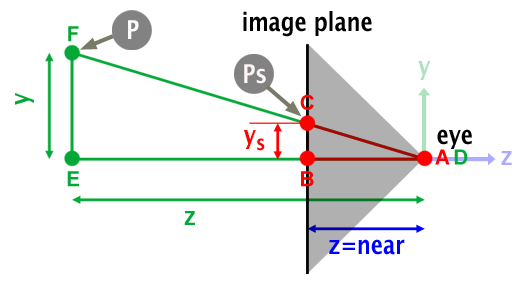 $AB = D$ is the total distance from eye to the image plane and is usually set to 1. Not the answer you're looking for? Browse other questions tagged rendering geometry projections perspective or ask your own question. What is this triangle sub-division scheme called?